Looking through the LAMS/Learner and commuter motorcycle range (2014) I found another unknown model from Benelli for you to consider. This one is called the BN302 and here’s my take on what this motorcycle is all about. As I have said previously Benelli is an old Italian brand (made in China though) is on the rise and along with the larger BN600 the BN302 is aimed squarely at the learner and commuter motorcyclist rider. The BN302 is part of the plan and does appear to be a decent entry level motorcycle. In terms of the important engine performance and specifications the BN-302 is similar to the other 300cc motorcycles from Honda and Kawasaki. The claimed weight of 185kg – although not specified if that represents dry or kerb weight if wet it’s almost light if not it’ll be class average which is still perfectly acceptable. Weight means a lot when you don’t have much power to start with! If the build quality of the mass produced examples of the BN302 are as good as the competitors it should definitely be a model to consider. However it is unfortunate that it’s reputation will be at least initially clouded with the stigma of poorly built cars from China. I do think that a historical brand needs to be built in the country of origin, to add to the image and reputation. Unfortunately the accounting and MBA mind set of the generation don’t quite seem to understand what to do or deal with this sort of thing. In terms of style the BN-302 is a good looking bike although the KTM and the Kawasaki do look better. 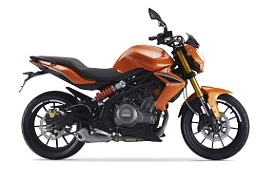 It’s design also reminds me of the Z1000 that was made over a decade ago which won’t help it’s sales figures – don’t get me started on the location of the rear shock. More design effort to look different needs to be made in this department to live up to the image and expected sales. So far the Benelli BN-302 looks good on paper and in the pictures but its not up to the standard I expected for this brand. Kerb Weight: 185 kg ? ?